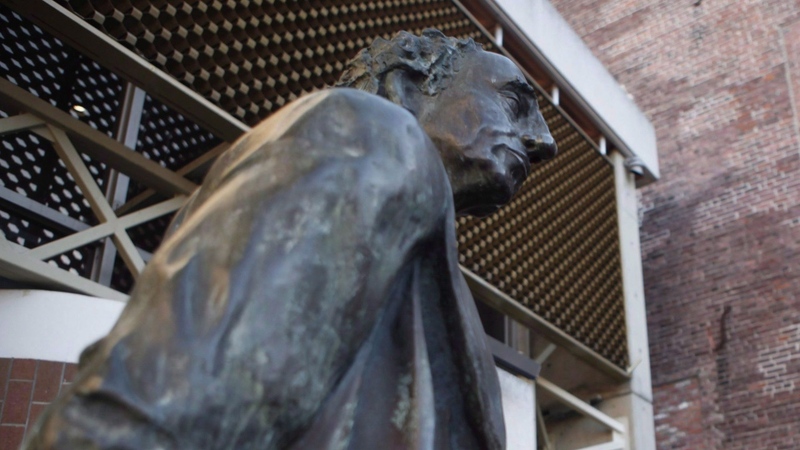 The City of Victoria took down a bronze statue of Sir John A. Macdonald, Canada’s first prime minister and an architect of the country’s residential school system, from the steps of its city hall on Saturday, calling it a gesture of reconciliation toward Indigenous groups that have long called for its removal. City councillors voted seven to one in favour of removing the statue earlier this week, a decision that has inflamed debate about how best to reconcile Macdonald’s role in shaping the country and his legacy of mistreatment of Indigenous peoples. Some have accused the city of “historical vandalism,” and a small group of protestors clad in large Canadian flags protested the statue’s removal Saturday morning. Macdonald, who served as prime minister for nearly two decades until his death in 1891, has long been celebrated by some for his role as the driving force behind Confederation more than 150 years ago. His name or likeness is on highways, buildings, schools and streets across the country, and he is in most Canadian wallets—on the $10 bill. But his policies were also responsible for the creation of the residential school system which, for over a period of roughly 100 years, took nearly 150,000 Indigenous children from their families and placed them in boarding schools, where the Truth and Reconciliation Commission found “child neglect was institutionalized.” The program amounted to “cultural genocide,” the commission concluded. But others believe the statue should remain. “We can look to the past, acknowledge and learn from mistakes, and celebrate achievements at the same time,” he tweeted. Geoff Young, the only city councillor in Victoria to vote against the statue’s removal, told CTV News Channel that he was not convinced the decision would advance reconciliation and that he was surprised he was the lone vote against removal. “Unfortunately, by taking the statue away and putting it in storage with only a couple of days’ notice, we’re creating more discord and disharmony rather than helping this debate,” he said. He added that while he is “sympathetic” to the Indigenous groups, he would not be opposed to moving the statue to a more “neutral” location. Helps told CTV News Channel that she disputes claims that the removal of the statue amounts to an erasure of history. "Interestingly, by taking this move, we've had more conversations in Victoria and across the country about Canadian history than we've had in a long time," she said. "This allows us to have really important conversations about balancing commemoration and reconciliation." The 37-year-old statue will sit in storage until a committee decides what to do with it. Victoria is not the only Canadian city grappling with the question of how best—or whether—to honour figures like Macdonald. After much debate and public controversy, Halifax’s city council voted in January to remove the 85-year-old statue of British General Edward Cornwallis from a city park. Cornwallis, who is widely regarded to be the father of Halifax, issued a bounty for Mi’kmaq scalps in 1749.